Has your marble lost its shine? Your travertine looking dull and dirty? Have stains? Uneven surfaces? 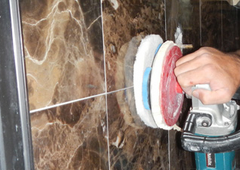 Do your granite countertops need repolishing? Call Santa Fe Floor Care today. Serving Greater Austin TX | Travis, Williamson, and Hayes counties. You'll be amazed at what we can do for your natural stone surfaces. For travertine, marble, slate and other stone as well as tile & grout cleaning and sealing, Santa Fe Floor Care uses only the best quality products and techniques to keep your stone looking great. Our personnel are trained and qualified to clean, maintain and restore your floors and surfaces. VISIT OUR WEBSITE FOR YOUR FREE STONE AND TILE CARE GUIDE.